Hello - I'm thrilled to announce the 2nd Annual 12 Pearls of Christmas! We've lined up several authors to share their Christmas "Pearls of Wisdom"! Please follow along beginning today (Monday the 13th) through Christmas day as Melody Carlson, Lauraine Snelling, Rachel Hauck, Tricia Goyer, Maureen Lang, and more share their heartfelt stories of how God has touched their life during this most wonderful time of the year. We are also providing this series as free content for your own blogs (as 12 html posts) - if you'd like to share the 12 Pearls of Christmas with your blog readers email (amy@litfusegroup.com) and she'll send you the content. AND BEST OF ALL ... there's also a giveaway!!!! 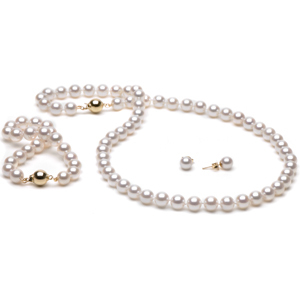 Fill out the quick form at the link located at the bottom of this post or any of the following 12 Pearls of Christmas posts (on any of the participating posts) to be entered to win a PEARL NECKLACE, BRACELET AND EARRINGS! You may enter once a day. The winner will be announced on New Year's Day! Pearls - a tangible reminder of God's grace to us all. Pearls of Patience by Margaret Mcsweeney As I write by the light of my Christmas tree on a late winter’s night, I reflect upon the poignancy and purpose of this season. The tiny white lights look like strands of pearls draped gracefully (perhaps haphazardly is a more honest description) across the evergreen boughs. Tomorrow I will hang the ornaments and at last place the angel atop the tree. Angels carry a special meaning this Christmas. My brother, Randy passed away on December 2nd from a heart attack at age 53. He was feeding a stray cat on his side porch. Randy was always like St. Francis of Asissi – animals would find him, sensing a kind soul. And my brother was a gentle and patient soul. He loved to fish. He tried to teach me, but I immediately lost interest when I realized worms were involved. And I could never sit still on the banks of a river and just wait. However, Randy could do that. He could wait, and waiting is a true gift. He put into practice the Scriptures. “Wait upon the Lord.” “Be still and know that He is God.” Patience doesn’t have to be passive. Wait is still an action verb. Part of the waiting process for fishing is seeking. Elaine (Randy’s wife of 31 years) told me that Randy said he could see the fish deep beneath the waters. He actively waited for the right time to catch them. During Randy’s last fishing trip on earth – just a week before his death, he felt an urgency to take a picture of the clouds with his cell phone. When he returned home, he showed the picture to Elaine. They realized that a face of an angel was looking at Randy from the sky – perhaps waiting for God’s timing to bring Randy home to heaven. In my heart I like to think that this “angel in the sky” was part of the heavenly host that appeared to the shepherds over two thousand years ago. A Christmas Angel. The Christmas Angels brought tidings of great joy that Jesus, our Lord and Savior was born. And because of that incredible gift from God that these angels announced, we all have the promise of eternity. Let us actively wait for His return by sharing our faith, offering hope and acting with love in everything we do. May each of you be blessed this Christmas as you celebrate the purposeful promises of the Season: Faith, hope and love. And may the 12 Pearls of Christmas be a blessing to you, too. About Margaret: Margaret McSweeney lives with her husband, David and two teenage daughters in the Chicago suburbs. After earning a master's degree in international business from the University of South Carolina, Margaret moved to New York City to work at a large bank where she met David. Charity and community involvement are very important to Margaret. She is the founder and director of Pearl Girls. For more information please visit www.pearlgirls.info. Margaret is fast at work on several fiction manuscripts and her book Pearl Girls: Encountering Grit, Experiencing Grace was written to help fund the Pearl Girl Charities. Connect with Margaret on Facebook or Twitter.